Analytical Armadillo: Infant Reflux & Nice Guidance - is Current Practice in the UK, Really Best Practice? Infant Reflux & Nice Guidance - is Current Practice in the UK, Really Best Practice? "The rise of prescriptions owes a lot to advertising, specifically to use of the term “acid reflux.” Before the mid-1990s, this term was hardly ever used in clinical practice; the medical terms were and are “GER” and “GERD.” In the mid-1990s, rules around direct-to-consumer (DTC) advertising were relaxed in the United States, and expenditures on broadcast advertising for drugs began to ramp up by multiples.23 Around this time, marketers for pharmaceutical companies began to promote and popularize the term “acid reflux” in the increasing advertising blitz for acid-suppressing drugs, both PPIs and H2RAs. “Acid reflux” became embedded in the popular lexicon thanks to the strategy devised by those “not so Mad Men.” The reasoning was simple: if reflux is possibly present—whether physiologic, acid, or non-acid—and you choose to call it acid reflux, it naturally follows that it requires an acid-reducing drug! This manages to blur the lines between normality and pathologies and, with an uncomplicated message to the marketplace, bypass the need for the subtleties of clinical diagnosis. In 2005, PPI sales grossed approximately $13 billion in the United States alone, and the drug on which the most DTC advertising was spent was a PPI." This increase has brought with it more questions from parents, so I decided to explore the evidence and rationale versus any long-term risks. If a baby is suffering damage of the oesophagus or is at risk of aspirating acid, the risks of medication may be minor in comparison. If not, the risks may outweigh benefits. 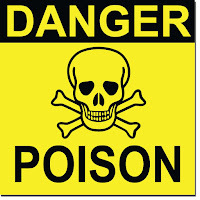 1.2.1 Do not use positional management to treat GOR in sleeping infants. In line with NHS advice, infants should be placed on their back when sleeping. 1.2.2 "In breast-fed infants with frequent regurgitation associated with marked distress, ensure that a person with appropriate expertise and training carries out a breastfeeding assessment." Anyway, hands up if that happened for you? Anyone else wondering what constitutes a "person with appropriate expertise and training"? I decided to ask parents via a poll how often their healthcare providers had indeed, fully evaluated breastfeeding as a first course of action. GP followed the guidelines well, suggesting she attend a local feeding group for an assessment to rule that out as a potential cause of reflux She said: "We went on to have posterior tongue tie diagnosed which was revised and reflux symptoms reduced dramatically"
One replied her paediatrician had referred then to the infant feeding team whilst still in hospital, a tie was treated but the problems didn't resolve. Further assessment however suggests baby still has a tongue tie..
GP checked if a feed had been observed and it had twice, both on children's ward and again by a midwife in hospital who both said it was fine. However independently of this her health visitor asked a peer supporter to check for a tongue tie, one was found and treated which resolved symptoms. Had a feeding assessment, tongue tie discovered and treated which resolved the problem, but from her own digging not due to suggestion from a health professional. 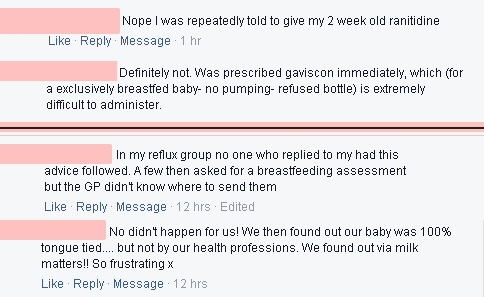 (names removed for privacy): After crying down the phone at my HV, she sent a community nursery nurse over to see me stating she was her 'breastfeeding expert'. She checked baby for tongue/lip tie and then watched me through one feed and said immediately that my daughter had silent reflux. It could be an indication of something else bothering my child. She told me what to say to my GP and by that evening, we had a prescription for ranitidine. The nursery nurse called me after a couple of days to check things had improved and came back a week later to weigh my daughter and check feeding positions for reflux etc. My daughter had lost a lot of weight and was still unsettled and she suggested at that point that with the mucus nappies, it was highly likely there was a milk allergy. Again she told me exactly how to deal with my GP. "I went to my local children's centre as I was having difficulties. They suggested a specialist breastfeeding clinic (run by the children's centre) where a lady watched me breastfeed. 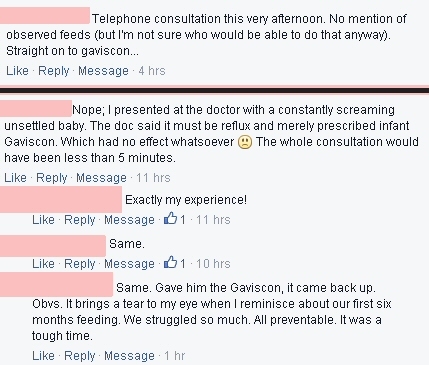 She couldn't see anything wrong with the latch, thought perhaps baby couldn't cope with speed of flow, but suggested some different techniques and if they didn't work to see my GP." "It was a health trainer we saw and was referred by our health visitor. Re the reflux my daughter has a mild posterior tongue tie but it was not treated as it did not impact on feeding." " I went to a breast feeding cafe support group and went to see community midwives. Should say both of them repeatedly missed the diagnosis of TT which was v disappointing." This is a frustrating topic - reflux is often something we are automatically told that baby will 'grow out of', OR were lead to believe there's something wrong with the stomach and medicine is perscribed. It should be so simple, and start with a feeding evaluation BEFORE medication! How are parents supposed to know what's a normal tongue/ Normal feeding and what isn't? TT babies often find compensation methods of feeding which to an untrained eye (Dr!) or new mum and is classed as normal! Are there enough people in the industry to treat / identify the amount of babies with these issues? Who can we trust if there isn't?! The feeling of desperation of not being listened to/ having to see your child suffering daily / hourly is a tough passage to deal with when noone is helping... It's not like a broken arm which can be seen clearly and treated immediately. They don't live in our houses and see our day to day struggles with reflux. Why do we hear so much of this? There is a massive gap in the industry and there are too many of us now that need to be listened to. Thank you Charlotte and All the amazing people out there who are helping to set this straight. We were diagnosed with PTT and treated at 8 months. Every day he is getting better and is finally off his cocktail of medication. In my experience, the infant feeding team had little to no understanding of tongue tie, the HVs gave incorrect feeding tips and the only advice that was correct, helpful and resolved the issues came from a board certified lactation consultant who we engaged privately.